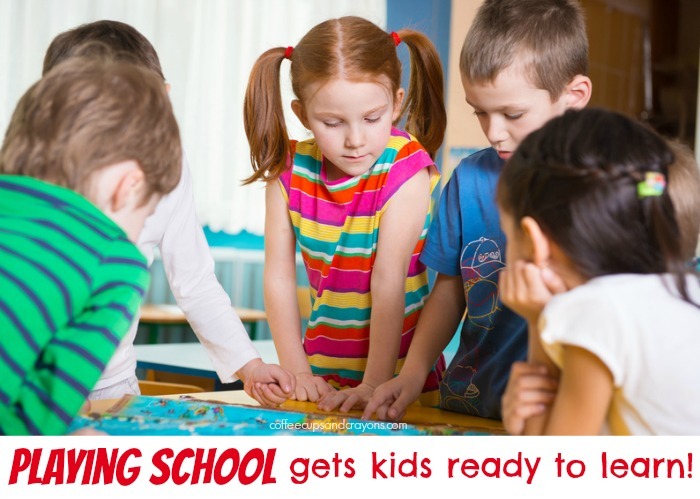 Getting ready for kindergarten is both exciting and overwhelming for kids and parents! To make the transition easier for everyone we are bringing back our Get Ready for K Through Play series. During this weekly summer series we will be sharing simple, hands on learning activities that will help your child develop the kindergarten readiness skills they need in a FUN and playful way. We’re kicking things off this week with social and emotional readiness skills! From both a parent and teacher perspective I’ve seen how social and emotional skills can be introduced and practiced through play. Young kids can process and internalize new information and routines through play and what better way to get ready for kindergarten than by playing school! Playing school at home is a great way to prepare kids for the situations that occur at school and give them the tools and confidence they need to be successful. These skills will come up naturally on their own while playing with other kids, but if there is something specific your child needs extra practice with jump in and play too. Role playing is a great way to learn something new! The transition to kindergarten is a big one and dealing with transitions and new situations is tough for young kids. Rehearsing saying goodbye to mom and dad and pretending to go through common school routines helps to reduce anxiety kids may have about starting school. Pretending to go to lunch at school and practicing raising your hand to go to the bathroom is fun and a great way to practice the transitions during the school day. Knowing what to expect makes everyone feel more secure and playing school helps kids handle not just the transition to school, but also the transitions within the school day more confidently. A large part of being ready for kindergarten is being able to follow classroom rules and the directions of the teacher–no fun or learning would take place in a classroom full of 20 kids who are off task. Kindergarten teachers spend a lot of time at the beginning of the school year teaching kids the routines and culture of the classroom, but getting the chance to be the teacher at home while playing can help too! Playing is a great way to learn about following directions and it’s even more beneficial when a child gets to experience directions and rules as both the student and the teacher. Unpacking your lunch, raising your hand, walking in the halls quietly, doing classroom jobs–these are all skills kindergarten kids need that may not come naturally. By playing student and teacher at home kids can get in lots of practice in a fun way! Taking turns with supplies can be challenging for kids at this age, but having to wait and take turns with the teacher’s attention can feel like torture for some! Playing school and getting to “be” the teacher gives kids a perspective into how crazy it is to have everyone need you at once and why you need to wait sometimes. It also gives kids a chance to practice that turn taking skill when they are playing the part of the student. Remember that social and emotional skills are skills that need to be learned and practiced just like learning the alphabet or hopping on one foot. Kids don’t catch on overnight–there is a lot of practice and play that happens along the way before you see changes. Playing and working with your child on these skills make a difference! So grab a chalkboard and some school supplies and get ready to play school with your little one. It’s not only a fun way to spend the afternoon it’s also a great way to Get Ready for K Through Play! Find the rest of the Get Ready for K Through PLAY! 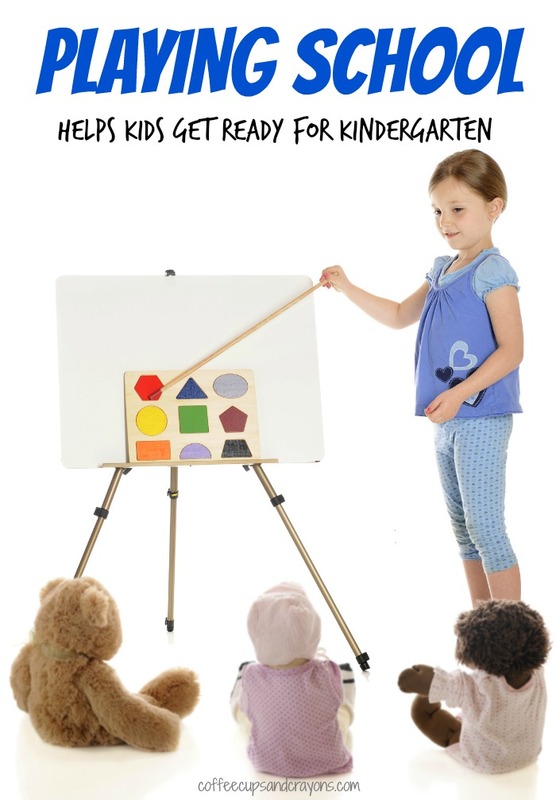 posts as well as many more kindergarten readiness ideas on our Get Ready for K Through PLAY! Pinterest Board! My kids love playing school – having an older child in the school system has really helped but we’ve also watched a few programmes about school as well as read books to give us some ideas to incorporate into play. They love finding my old register sheets and doing a daily register for us over breakfast. This is such a great way to help kids feel more comfortable with the new routine of Kindergarten. Pinned and stumbled!